This Bergamot Almond Polenta Cake has an intense citrusy and floral flavour. It is one of the most delicious cakes I have eaten in a long while. Using fragrant Bergamot Oranges makes all the difference in this cake. As Bergamot Oranges are sometimes hard to get, you can also use a less acidic and more floral lemons like Meyer lemons or Amalfi lemons (the ones used to make limoncello). Whatever you’re buying make sure you use organic, unwaxed lemons or Bergamot oranges as the peel plays a big part in this recipe. I love Bergamot Oranges. A Bergamot orange is somewhere in between a large lemon and an orange. It’s citrusy with a beautiful freshness and a subtle sweetness. There’s a good reason why Bergamot oil is used so much in perfumes. It has a crisp, clean, floral scent that takes you right back to the Mediterranean. If you enjoy Earl Grey tea, you will be familiar with the fragrance and taste. Bergamot Oranges are available throughout winter. In Europe, they grow in Southern Italy (Calabria) Southern France and Turkey. If you can’t find Bergamot Oranges or any of the other varieties, normal, organic lemons will work too. Not only choosing the right lemon will make a huge difference in this recipe, but also choosing the right type of olive oil and honey. I used an organic Italian orange honey but if you are able to get your hands on an Italian Bergamot honey, it will work out even be better. A floral honey, thyme honey or lavender honey would work really well too. The extra virgin olive oil I used is from Calabria. It has a mild, buttery flavour and is excellent choice for sweet dishes like desserts, cakes and pancakes. To sweeten the cake I have both used honey and Rapadura sugar. For those unfamiliar with Rapadura sugar, it is a healthier, unrefined form of sugar cane. In Dutch it’s called ‘Oersuiker’. What makes Rapadura so much healthier for you is that’s not heavily processed. It’s not cooked at a high heat or chemically altered. That’s why your body is able to metabolize Rapadura sugar more easily. Rapadura sugar is made by extracting pure juice from sugar cane, which is then dehydrated at a low heat. During this process, it retains its vitamins and minerals and also its natural balance of sucrose, glucose, and fructose, and is metabolized more slowly than white, refined sugar. It will not affect your blood sugar levels as much as refined sugars. But remember, it is still sugar, so enjoy it in moderation. Inspired by the sunny flavours of Italy, this Bergamot Almond Polenta Cake is perfect on a cold day when you need a bit of sun shine. You can literally taste the sunshine in this cake. It’s intense, lemony and sweet, a real treat to share with friends or to treat yourself on a lazy Sunday afternoon. 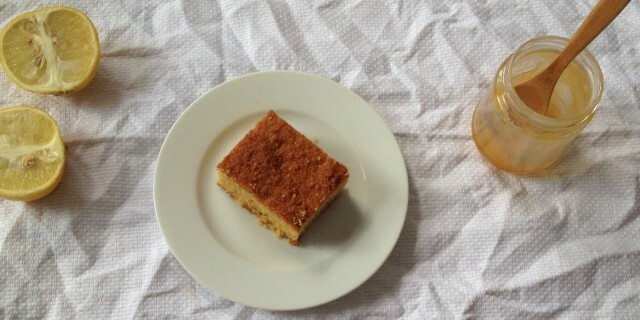 Make yourself or your friends a nice pot of Earl Grey tea, cut off a slice of the Bergamot Almond Polenta Cake, take a seat, rest back and let the sunshine come in with each bite you take. Enjoy! Grease and flour (using a little of the polenta) a 22 cm loose-bottomed cake tin. Mix all the dry ingredients (sugar, polenta, almond flour, salt) together in a large bowl. In a separate bowl, mix all wet ingredients together. Add wet mixture to the dry mixture and fold until thoroughly combined. Add the batter to the cake tin, spreading it evenly. Bake in the oven for 45 minutes or until a knife n the center comes out clean. One Response to "Bergamot Almond Polenta Cake"